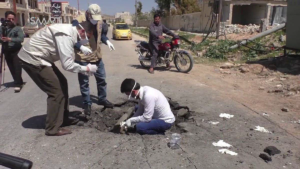 As Israel threatens an expanded war against Syria and Lebanon, an emotional justification is the alleged April 4 sarin attack that was blamed on the Syrian government despite huge holes in the evidence, as Rick Sterling reports. In early 2003, it was claimed that Iraq was a threat to other countries. Despite ten years of crushing economic sanctions plus intrusive inspections, supposedly Iraq had acquired enough “weapons of mass destruction” to threaten the West. It was ridiculous on its face but few people in power said so. Establishment politicians and media across the U.S. promoted the idea. In the Senate, Joe Biden chaired the committee looking into the allegations but excluded knowledgeable critics such as Scott Ritter. This led to the invasion of Iraq. Today we have something similarly ridiculous and dangerous. Supposedly the Syrian government decided to use a banned chemical weapon, which they gave up in 2013-2014. 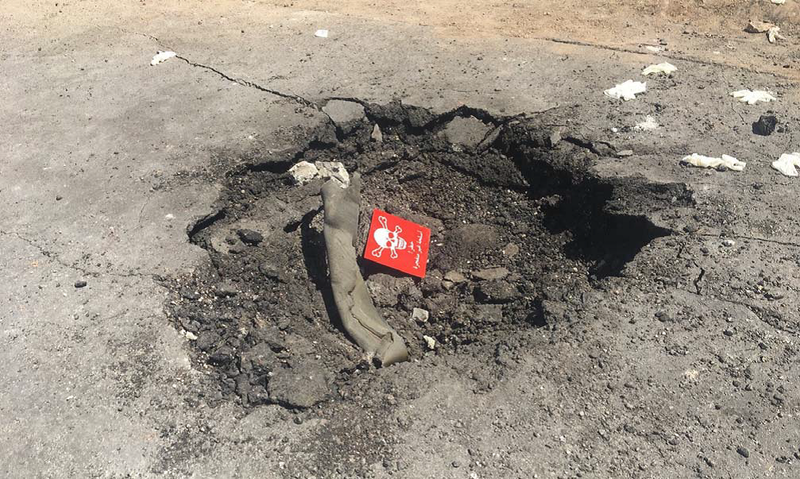 Despite advancing against the insurgents, the Syrian government supposedly put sarin in a Russian chemical weapon canister and dropped this on the town Khan Sheikhoun which has been under the control of Syria’s version of Al Qaeda for years. To top off the stupidity, they left paint markings on the canister, which identify it as a chemical weapon. Supposedly the Syrian government did this despite knowing there are many “White Helmet” activists in the town along with their cameras, videos, computers, Internet uplinks and Western social media promoters. Supposedly the Syrian government did this despite knowing that neoconservatives, neoliberals and Zionists are keen to prolong the conflict and drag the U.S. and NATO into it more directly. Supposedly the Syrian government did this despite knowing the one thing that could trigger direct U.S. aggression in the conflict is the use of chemical weapons: the “red line” laid down by Barack Obama. If the above sounds unlikely, it is. But even if these accusations should be laughed out of the room, as they should have been in 2002, let’s take the claims about the event at Khan Sheikhoun in Syria on April 4 seriously if, for no other reason, than that certainly the consequences will be serious if the exploitation of this incident is not stopped. What Happened at Khan Sheikhoun? About 36 hours later, the report was leaked via the Internet. But the die was already cast as establishment media had “confirmed” Syrian guilt. Following are key contradictions and inconsistencies in the report produced by the Joint Investigative Mechanism of the U.N. and Organization for the Prohibition of Chemical Weapons (OPCW). –The Investigation Ignores the Essential Element of Motive. The three essentials in criminal investigation are Motive, Means and Opportunity. All three must be present. Yet the investigation team ignores the question of motive. The Syrian government has every motive to NOT use proscribed weapons. On the other side, the armed opposition has a strong motive to implicate the Syrian government. They have been calling for U.S. and NATO intervention for years. They are losing ground, recruits and allies. Yet these facts are never considered. –The Investigation Relies Primarily on Biased Sources. Any “defense institute” connected or contracting with France, U.K. or U.S. will have inherent assumptions and bias since these governments have actively promoted overthrow of the Syrian government. 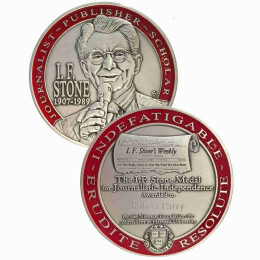 –The Investigation Ignores Credible but Critical Analyses. – MIT Professor Theodore Postol has analyzed the Khan Sheikhoun incident. He persuasively challenges the main theory about the crater site and munition. – Investigative journalist Gareth Porter has written an exposé titled “Have We Been Deceived over Syrian Sarin Attack? Scrutinizing the Evidence in an Incident Trump Used to Justify Bombing Syria.” Porter presents a devastating critique of the sarin-crater theory. He documents how easily false positives for sarin could have been created and how the OPCW has violated their own investigation protocols. 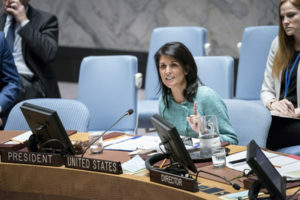 – Researcher Adam Larson has written an exposé titled “Syria Sarin Allegation: How the UN-Panel Report Twists and Omits Evidence”. After closely inspecting the photographs and videos, he questions whether the victims are civilians kidnapped from a nearby village five days previously. 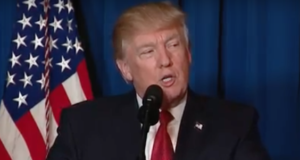 Larson’s site “A Closer Look at Syria” has a good index of videos and articles on this and other events. The above “open source” analysis and information was published well before the current report but apparently not considered. A “rigorous, independent examination” needs to evaluate investigations such as these. –Victims Appear Before the Attack. Another photo of the crater containing the alleged canister that supposedly disbursed sarin in Khan Sheikdoun, Syria, on April 4, 2017. It is reported that “The Mechanism did not investigate these discrepancies and cannot determine whether they are linked to any possible staging scenario, or to poor record-keeping in chaotic conditions.” Given the importance of determining whether this incident was caused by the Syrian government or staged by elements of the armed opposition and their supporters, why were these discrepancies not investigated further? Clearly it is not possible that victims were transported 125 kilometers and delivered to a hospital in 15 minutes. This is potentially powerful evidence of a staged event. –‘White Helmets’ Were Warning of a Chemical Weapons Attack Before the Attack. It seems reasonable to ask: Was the advance talk of “toxic chemicals” a signal to get ready for a staged event? How would a plane spotter know there was a one-time chemical bomb aboard? This is another area that needs more investigation. –Were Syrian Planes Over Khan Sheikhoun at the Critical Time? The basic question of whether or not there were Syrian jets over Khan Sheikhoun is unanswered. The Syrian military says they did NOT fly over Khan Sheikhoun in the early morning. Page 21 documents that the Syrian pilot and log books record that the Su-22 jet was executing attacks at other nearby towns and not closer than 7 to 9 kilometers from Khan Sheikhoun. Radar track data from the U.S. appears to support this, indicating the Syrian jet path was 5 kms from Khan Sheikhoun. There are conflicting testimonies on this issue but curiously no video showing jet fighters at the time of the explosions in Khan Sheikhoun. It is unconfirmed how the ground explosions occurred. –The Investigation Team Did Not Try to Visit the Scene of the Crime. While it is certainly appropriate to consider security, the actual scene of a crime provides unique opportunities for evidence. The OPCW has previously stated the necessity of having access to a crime site then taking and transferring samples to a certified lab with a clear chain of custody. If the insurgents still controlling Khan Sheikhoun have nothing to hide, they should welcome the investigation. Furthermore, Russian authorities offered to guarantee the safety of the inspection team. Yet the investigation team apparently made no effort to visit the site. Why? In an investigation of this importance, with potentially huge political consequences, visiting and analyzing the scene of the crime should be a requirement if at all possible. –The Material Evidence Comes from Insurgents with No Verifiable Chain of Custody. On page 23 it says “Samples taken from the crater and its surroundings were found by the Fact Finding Mission to contain sarin.” On the day of the event, insurgents took soil samples and victims to Turkey where they were received and subsequently tested. Without verified origins and “chain of custody”, this data cannot be verified and must be considered skeptically. As indicated in the report, one theory about the April 4 event is that it was staged to implicate the Syrian government. If that theory is correct, it is predictable that the plotters would have samples prepared in advance, including sarin samples with markers matched to the Syrian stockpile. The Syrian sarin was destroyed aboard the U.S. vessel “MV Cape Ray.” Given the heavy involvement of the Central Intelligence Agency in the Syrian conflict it is likely they analyzed and retained some portion. –The Report Repeats Discredited Claims about Bomb Fragment and Filler Cap. This information may come from a Human Rights Watch report, which has been discredited. The “filler cap” was supposedly a match for an external plug for a Russian chemical weapon bomb but was found to not match and to be based on a 1950’s era museum photo. An insightful and amusing critique of the HRW report is here. The authenticity of the fragments in the crater is also challenged by the lack of a tailfin or any other bomb fragments. A chemical weapon bomb is designed to release and not burn up the chemical and therefore the munition casing should be on site. –Strange Actions Suggesting a Staged Event. The report does not mention the video, which shows “White Helmet” responders handling victims without any gloves or protection. If the patients truly died from sarin, touching the patients’ skin or clothing could be fatal. Incidents such as these support the theory that this was a contrived and staged event with real victims. –The Team Is ‘Confident’ in Their Conclusions Yet Basic Facts Are in Dispute. How can they be “confident that the Syrian Arab Republic is responsible for the release of sarin at Khan Shaykhun on 4 April 2017” when such basics have not been confirmed? The report of the Joint Investigative Mechanism (JIM) gives the impression of much more certainty than is actually there. Seizing on the false “confidence,” the White House has denounced the “horrifying barbarism of Bashar al Assad” and “lack of respect for international norms” by Syria’s ally Russia. International diplomacy is being steadily eroded. Most Western “experts” were dead wrong in the run-up to the invasion of Iraq. Are these same “experts,” institutes, intelligence agencies and biased organizations going to take us down the road to new aggression, this time against Syria? In contrast with the JIM report, Gareth Porter reached the opposite conclusion: “The evidence now available makes it clear that the scene suggesting a sarin attack at the crater was a crudely staged deception.” That is also more logical. The armed opposition had the motive, means and opportunity. If you want to see how stupid American journalists and their American audiences can be, just look up the CBS “60 Minutes” program on the White Helmets. They show White Helmets furiously digging sand away from the head of a little girl, not a survivor in an air pocket created by large rubble, but a sand-breathing girl! Shown, after a cut in the film, removed from the sand and crying–even with the air supply they certainly provided her, being buried alive must have been terrifying for her. If that wasn’t enough, near the sand-breathing girl and also in the picture of her “rescue” was a man also buried in the sand with the top of his head showing and one arm out. Why he didn’t just raise his head out of the sand went unexplained. His arm was moving in a gentle swimming motion, not attempting to clear his head of the sand and not indicating any desperation for air. You can almost hear the director telling the man to move his arm so the American audience will know that he’s not dead and that the heroic White Helmets will reach him in time. If CBS and their American audience cannot see what’s right before their eyes, how can they possibly reason through the evidence of false flag attacks and other CIA provocations. Let the world beware of the United States of Orwellia! 100% USA scam and lies. Is America going to be exposed and made to pay? Not likely. Down fall of America was the Zionist plot hatched up by Bill Clinton 1996 and by AIPAC. “7 middle East Countries need to be destroyed for security of Israel”.The lies kept piling up..–Syria gas attacks. No shame on America! This is almost a bit of an understatement. The entire dynamic was one of the most disturbing and sickest displays of massive mob mentality I’ve ever seen. Otherwise bright, liberal minded friends and others would assure one with smug self-satisfaction bordering on condescension that Saddam was dead set on wreaking violent havoc across America tomorrow morning with his huge stockpiles of WMD. After all, they had been reading all this month after month in WaPo and the NY Times, and were listening to this month after month on PBS News Hour, NPR, and CNN (“It’s not just FOX News! You do know.”). The parallels to today are absolutely striking — The Kremlin certainly blatantly interfered in the Prez election, Putin invaded Ukraine, Moscow annexed Crimea, Russia is gearing up to bomb the Eastern seaboard, Russkies are under your bed at night and will make you go blind. If there has ever been a more ignorant, insouciant, or brainwashed population than the American people it’s definitely not many, not many at all. We’re amidst a dangerous groupthink that could kill the entire world. And yet the mob mentality carries onward. Sayyed Hassan Nasrallah just said Saad Hariri, PM of Lebanon, announced yesterday, from Saudi Arabia, on Television, Interesting he accused Iran and the Hezbollah movement of interfering in internal affairs of Arab countries and Nasrallah advises the Hariri’s resignation broadcast were Saudi dictated. Then announcement to invade and occupy N. Korea as the only way to find the nuclear weapons (a kind of Iraq deal)..Israel announces it is going again invade Syria, bombing is occurring many places in Syria, and now the Syria Sarin disproven event appears once again. something is about to happen.. ??? I wrote the piece about the Human Rights Watch report that Rick links to in his (excellent) analysis. I did so as it seemed someone had to – it’s flaws are so obvious that you have to assume that people who rely upon it as proof either have never read it or are complete dunderheads. That HRW can get away with such demonstrable piffle speaks volumes about our corporate media. Even on my first read through I noticed that they had described the alleged bomb crater as being less than ONE INCH in diameter, that their witnesses contradicted each other and that their star witness blatantly contradicted himself. Another read through showed that almost every paragraph raised questions about HRW’s approach and/or the veracity of their witnesses. It’s a monstrously cynical piece of work that promises much, but delivers nothing by way of evidence. They claim to have seen videos that would put a lot of the debate around the Khan Sheikhoun incident to bed, but refuse to publish them. It’s clear that the UN Fact Finding Mission used many of the same witnesses as HRW (the only one quoted in the FFN report describes an incident of seeing a boy fall over that occurs in the HRW report, but they failed to follow up on the glaring problems raised – or apparently ask any of them why none of them bothered to take any photos or videos AT ALL of the immediate aftermath. That no record of the alleged rescue operation exists is one of the main pieces of evidence that leads me to be convinced that the events were staged – I simply cannot beleive that the never-usually-camerashy White Helmets would miss such an opportunity. Some of them said they had time to return to base to retrieve safety equipment, but not one of them thought to pick up a camera. HRW reported two local journalists who videoed the smoke plumes and then attended the scene, but neither thought to take their cameras with them either. Actually one White Helmet has stated in an Al Jazeera interview that he was filming the events when he was overcome by the gas – but hey too didn’t seem bothered enough to ask him for his pictures. The other main piece of evidence that prove to me that the JIM report is rubbish is the appalling circular logic that they use to ‘prove’ the wind conditions that morning – they infer it from the locations of the alleged casualties – completely ignoring the fact that the videos they make such a great deal of elsewhere show the smoke moving in completely the opposite direction (see Adam Larsons great work linked to in the article above). Adam pointed this out to the JIM using their published proceedures, but was completely ignored. Patients and wounded admitted to hospital prior to the attack? Reminds me of L. Fletcher Prouty’s story of picking up the local paper in Christchurch prior to flying home and it had the info on L. Oswald ahead of the arrest and “investigation”. Except this was a “staged” event. Still the two are premeditated. Its quite obvious that the American deep state has the O.P.C.W under its control just as they have Trump exactly where they want him. I expect the FBI, the CIA and others have been blackmailing members of the O.P.C.W to come up with this ridiculous finding. If indeed the O.P.C.W did actually come up with this rubbish on their own, then they are thoroughly discredited and any future work and findings they come up with will be be forever doubted. I’ll bet the neocons are kicking themselves for not claiming Hezbollah was the attackers. Especially since Syria is winning and Hezbollah looks to be the next target. As is indicated by the evidence presented, the whole report was a put-up job and reveals that key elements of the UN have been colonized by the US deep state, making the report a dangerous travesty with conclusions contrary to proven facts. What is especially damning is the fact, even admitted by contributors to the report apparently, that some of the casualties were let into hospitals before the alleged time of the purported air raid. The facts stated reveal the false flag nature of the whole operation so obviously that only fools and those reading the lamestream yankee controlled media could lend any credence to it. Unfortunately, the consequences of the story however, could create dangerous tensions which could conceivably lead to nuclear war if they are not reined in. Disappointing to see the OPCW is in the bag for the U.S. & Friends. Russia was right to deny Security Council authorization for an extension of the mission. Still, it seems they left a fair amount of information in the report that can be used to discredit their own conclusions. Perhaps that was a quiet act of rebellion on the part of some of the investigators. Glad you brought this up David, because the whole time while I was reading Rick Sterling’s piece here, I started thinking that the real investigation should be to see who paid off the OPCW, JIM, and HRW. I saw Prof. Postol on RT this morning making some of these points. He’s been calling BS on official U.S. deceptions at least since the 1991 Gulf War. Nevertheless (in fact, of course, I mean “therefore”) he is ignored by U.S. media. Maybe they can drag Colin “Anodized Aluminum Tubes” Powell out of retirement to explain to us how that filler cap absolutely makes the case against the Syrian military. Someone took video of the White Helmets collecting their samples for the photographers. 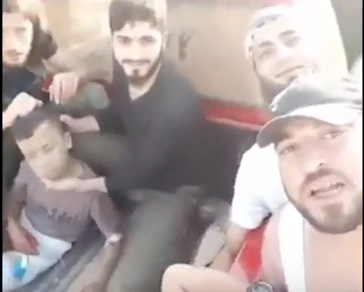 Although even the stuff they released showed the impossibility that they were at the site of a sarin gas attack just a couple hours earlier, this video clearly shows them staging various levels of legitimacy-imitating. Compare and contrast the fact that the MH17 site in Ukraine was considered very dangerous yet various international groups forced their way in to investigate – yet Khan Shaykhun was deemed virtually unreachable? And why did the team even refuse to visit the even much safer Sharyat air base from where the aircraft is said to have launched? the most likely explanation here is that the white helmets/rebels staged Khan Shaykhun with tacit approval from Turkey, the CIA and Israel, hence their force feeding the world this trush about Assad being so irrational to cross a red line the whole world has been made aware of. Hopefully one day the world will wake up and realize how evil the US government and its millitary machine is. “The evidence now available makes it clear that the scene suggesting a sarin attack at the crater was a crudely staged deception.” Yes, and the fact that Turkey’s Erdogan was one of the chief proponents of regime change in Syria makes the charges that much more suspect. The “heroic’ white helmets were simply props in a staged event. 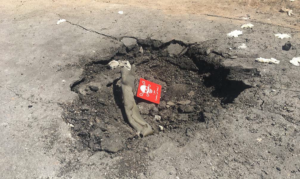 Reviewing the report, it is immediately obvious the JIM totally failed to address the critical chain of custody issue concerning the purported physical “samples” allegedly collected from the “impact site” or “crater” – a hole in the road in Khan Shaykhun. The OPCW-JIM report repeatedly refers to an unnamed “defence research institute”, an unnamed “independent expert”, and unnamed “forensic institutes” engaged by the JIM. In short, the latest OPCW-JIM report is a Bellingcat “investigation” report dressed in OPCW drag. Kaszeta later backed evidence free “Israeli intelligence” claims about Syria. Following the Khan Sheikhoun incident, Kaszeta was cited as a go-to “expert” by the BBC, UK Guardian, CNN, Time magazine, Washngton Post. NPR, Germany’s Die Welt and Deutsche Welle, Business Insider, Popular Science, Asia Times and the Associated Press. Israel is allied with Saudi Arabia and GCC backers of the Al Qaeda terrorists who have conducted numerous Chemical Weapons (CW) attacks in Syria. Google’s 2017 DNI Fund Annual Report describes Higgins as “a world–leading expert in news verification”. In the report, Higgins claims the DNI funding “allowed us to push this to the next level”. Damon Wilson, Executive Vice President of Programs and Strategy at the Atlantic Council, a co-author with Higgins of the report on Ukraine, effusively praised Higgins’ effort to bolster anti-Russian propaganda. The laudatory bio of Higgins on the Kings College website specifically acknowledges his service to the Atlantic Council: “an award winning investigative journalist and publishes the work of an international alliance of fellow investigators using freely available online information. 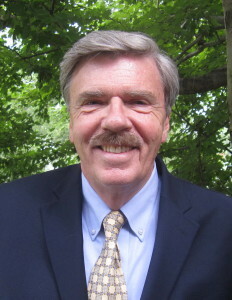 He has helped inaugurate open-source and social media investigations by trawling through vast amounts of data uploaded constantly on to the web and social media sites.” While it honors Higgins’ enthusiastic “trawling”, King’s College curiously neglects to mention that Higgins’ “findings” on the Syian sarin attacks were thoroughly debunked. The report’s other key author was John E. Herbst, United States Ambassador to Ukraine from September 2003 to May 2006 (the period that became known as the Orange Revolution) and Director of the Atlantic Council’s Eurasia Center. Other authors include Frederic C. Hof, who served as Special Adviser on Syrian political transition to Secretary of State Hillary Clinton in 2012. Hof was previously the Special Coordinator for Regional Affairs in the US Department of State’s Office of the Special Envoy for Middle East Peace, where he advised Special Envoy George Mitchel. Hof had been a Resident Senior Fellow in the Atlantic Council’s Rafik Hariri Center for the Middle East since November 2012, and assumed the position as Director in May 2016. There is no daylight between the Atlantic Council’s “regime change” initiatives and the fake “online investigations” of Higgins and Bellingcat. Your comments are always very informative. Thank you. You lay bare the schemes and deeds of the Governments, Think Tanks, Institutions, and individuals who are the perpetrators of this carnage of death and destruction going on over this planet. It’s clear that the OPCW did little to no actual investigation, preferring to rely on Bellingcat “open source” shenanigans. Abe – yeah, and Building No. 7 collapsed at free-fall speed, into its own footprint because of fire, according to N.I.S.T. Seems like everything is dressed up in high heels and pretty lipstick these days. Hey backwardsevolution, Judy Woods gives a brilliant lecture on why the twin towers turned to dust actually in free fall leaving nothing but a small pile of rubbish on the ground. Her lecture is scientifically sound is is well worth a look. Its on youtube . Just type in Judy Woods twin towers and it will come up. Higgins and Kaszeta’s many “smoking gun” conspiracy theories are as “scientifically sound” as Woods’ “dustification” theory. Both Higgins and Woods give “brilliant” lectures about piles of rubbish on the ground. Obviously that’s why you just typed in and it came up. 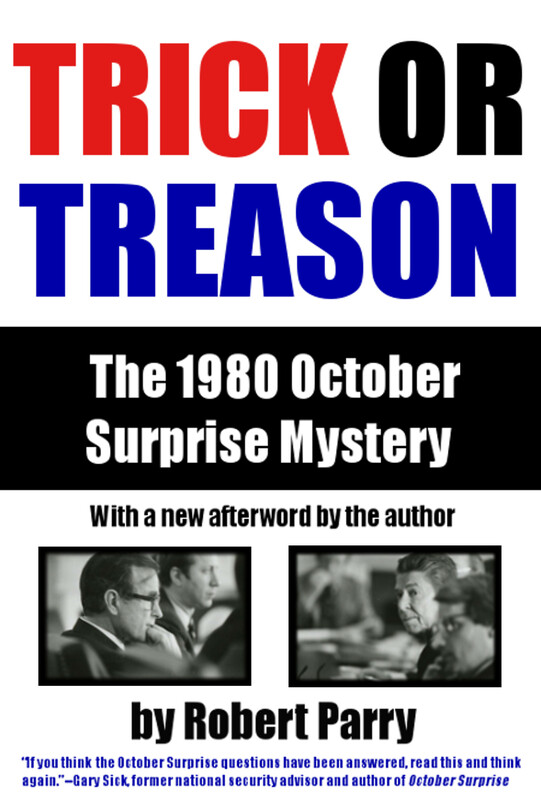 Higgins and Woods are twin towers of trumped up conspiracy theory masquerading as fact. The “air dropped bomb” conspiracy theorist Eliot Higgins is to the Khan Shaykhun event as the “energy weapons” conspiracy theorist Judy Woods is to the World Trade Center event. Both rely on so-called “open source” material and illogic to promote their pre-determined conspiracy theories. A difference between Woods and Higgins is that Higgins’ pre-determined conspiracy theories more stringently conform to US-NATO “regime change” agendas. The “fascinating” 9/11 conspiracy theory of “Space Beam” Judy Woods is an apt comparison to the OPCW-UN Joint Investigative Mechanism report on the Khan Shaykhun incident. Both are unsupported by facts. The fact that the Judy Woods “space beam” conspiracy theory may not have validity doesn’t make the video less fascinating. I, like most of us am not a scientist and remain highly skeptical. Yes, it was off topic, but even you Abe have been off topic at times.